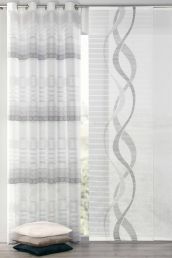 Pascal sliding curtain and Webster eyelet curtain: two trendsetting elements for decorating home windows. The two matching items set contemporary accents in any room. The sliding curtain with contemporary wave design and fine stripes is discreetly eye-catching; the eyelet curtain brings a relaxing atmosphere to the room through the horizontal stripe motif. 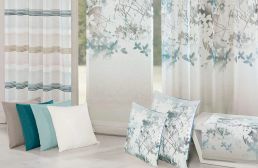 Both products consist of semi-transparent material so that sufficient light prevails even when the curtains are drawn. Other Products in "Fabric that moves"